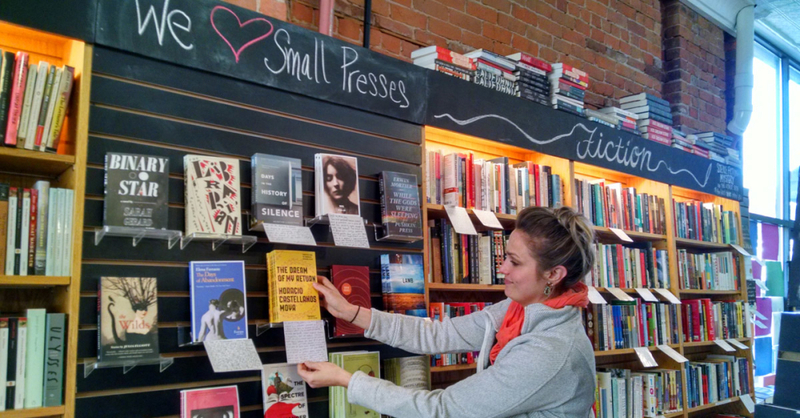 Literati Bookstore co-owner Hilary Lowe stocks shelves beneath a sign boosting small presses. Two years have passed since the owners of Literati Bookstore first opened their downtown Ann Arbor, Michigan doors in a business venture that raised as many skeptical questions as it did expectations. A bookstore? According to the experts, analysts, data miners and doomsayers, chances for success were slim. Current wisdom at the time said that people weren’t buying books in stores anymore. Borders couldn’t hold on to its flagship store in that very town, and several landlords passed on the proposed business. Instead, they beat the odds by carving out a noncompetitive niche of their own. They know their customer base well, and even the most prominent online sales behemoth wasn’t among their concerns. “Ann Arbor is a book town,” Hilary said of the business community Literati joined, a cool college town with a solid base of cultural appreciation for cutting-edge arts and literature. Books can be found at more than a dozen downtown spots, new or used, mass-market or specialty. Aunt Agatha’s has offered new and used mysteries for more than twenty years; holistic tomes have long been found at the Crazy Wisdom bookstore and tea room; Kaleidoscope Books & Collectibles, Dawn Treader, Common Language … people seem to read a lot in Ann Arbor, and with decidedly eclectic tastes. Each of the staff at Literati—including several Borders vets—has areas of interest reflected in the inventory and “recommended” displays, which span all genres. It’s an eclectic field populated—by design—with titles and authors not found at mass merchants or spotlighted among the top online choices for the week. From a sheer business standpoint, there was no point in going toe-to-toe with big-box stores able to deep-discount the current top-sellers. “It’s fun to see what people are reading,” Hilary said, an ongoing discovery that defies concerns of both online shopping and e-readers. People still read printed books, and enjoy browsing for them in the company of like-minded souls. That, Hilary said, is the foundation that can keep a store in business. “You can’t just be a bookstore,” Hilary said, indicating a guiding philosophy for both economics and purpose. The cultural climate in town opened the door for the store to host events, author readings and discussion groups—including a feminist book club that routinely welcomes nearly one hundred readers—and to support nonprofit literary groups including 826Michigan, a school-outreach writing program. Last year the store expanded a bit, moving its children’s section to a previously unused third floor and subleasing the balance of the space to The Espresso Bar, which on a weekday afternoon was at capacity with customers enjoying their drinks, working on laptops, or reading recently bought books. The extra room, Hilary said, was needed for events that had become too crowded for the book-filled main floor and basement. Strategies for events fall under three categories, she said, a foundation that equally clarifies the store’s overall approach: “Either we really believe in it; it’s what our customers want; or it’s good for the community,” Hilary said. “The chains aren’t plugged in to the community,” Hilary said. “We pay rent, local taxes, and hire people locally because it’s the right thing to do.” Future plans include more of the same, whether expanding its menu of discussion groups, hosting off-site events, or partnering with local schools. Here’s to a happy anniversary for Literati, a book store that has become as much a part of its community as it has, appropriately, found success as an independent business. 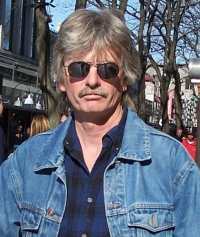 James A. Mitchell is a veteran reporter and author of four books, including The Walrus & the Elephants: John Lennon’s Years of Revolution and But For the Grace: Profiles in Peace From a Nation at War. You can follow him on Twitter @jamesamitchell3.